Many people who attempt to house train their dog fail because they're using old and ineffective house training methods. Failed or long drawn out house training can be avoided by learning the correct way to house train your dog. Let's face it, no one wants to spend a month waiting for their dog to be house trained when it's "doing it's business" all over the house. Especially when there's an easier way that can work in as little as 5 days. The old method of yelling, spanking, or even forcing your dog's nose into it's pee or poop isn't based on modern training methods. Over the last 50 years training has come a long way and one thing that's been made very clear is that punishment is the least effective training method. In fact, it's been proven that in most cases dogs don't even know why they're being punished. The truth is, you don't need to use abusive, slow, and ineffective house training methods ever again. You're about to learn how you can house train your puppy quickly and easily, without any yelling or spanking. Imagine being able to house train your dog or puppy in as little as 5 days. You'll be able to soon, and it doesn't matter what breed you have or how "stubborn" it is. As the Author of another Pet Book called "The Pitbull Guide" that has been the best selling book in it's market for over a year, I'm really excited to tell you about my new book The House Training Guide. "The house training took only FIVE DAYS to accomplish, and I attribute this to the direct and to-the-point instructions provided by Mr. Zetrouer..."
After our eleven year old dog BEAR had recently passed away, our family adopted a young male 'Golden Retriever / Australian Shepherd' mixed-breed from the local SPCA office near our home in Buffalo, New York USA. 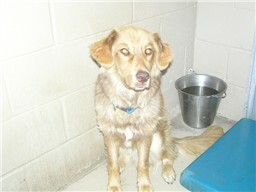 This new fellow is about 9 months old, and was found wandering around near a local private airport. We were told that he had never been house trained, but we were not going to let that get in the way of adopting and enjoying the company of our newest family member. Even though I have shared my life with many dogs in my 43 years, my wife had only one dog when she was a child growing up, as her parents are cat lovers. I struggled to remember when it was I last had to house train a dog. It was thirty years ago, when my dog Missy had a litter of puppies. Therefore, I needed to be reminded of the techniques, and my wife needed to learn them for the first time, as she had never trained a dog before. We had just adopted the dog who has come to be known as MAGICK, and were told by the SPCA staff veterinarian that this young dog was NOT house trained, and needed some extensive training. This would not be much of a problem, I told my wife. MAGICK turned out to be very affectionate, and very eager to learn and please his new family members. 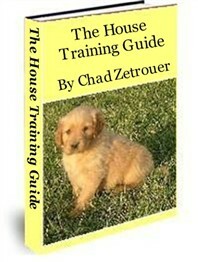 An Internet search quickly brought to my attention, the concise yet informative PDF booklet 'The House Training Guide' by Chad Zetrouer. I had heard of his Pit Bull training book, and I was ready to get started with the home-schooling of the dog named MAGICK. The house training took only FIVE DAYS to accomplish, and I attribute this to the direct and to-the-point instructions provided by Mr. Zetrouer. Even though it had been many years since I last house trained a dog, the quickness in which we were able to accomplish our goal was also because of my extensive training of dogs over the past three decades. 'The House Training Guide' does NOT waste the reader's time with endless stories and instructions that accomplish little else than fill up many more pages than is necessary. The information presented is direct, to-the-point, and gets the reader up to speed quickly with the task at hand. This is the best thing about Mr. Zetrouer's approach --- he provides ONLY the information needed, leaving all the rest behind. I am NOT interested in an overblown narrative, because as I am reading, my new family member is 'doing his business' on the carpet at my feet. The value of the information provided far exceeds the price of the book, and this is a reasonable investment, especially as it removes the negativity inherent in scolding the dog, who wants to please anyway. I give this booklet my highest recommendation, as it helped MAGICK to quickly understand what we want and expect of him, as he lives in our home. Thank you once again Mr. Zetrouer, for helping to show both MAGICK and my wife the proper method of training. Our home is once again at peace, while MAGICK begins his life as a member of our family. What I've done in my new book is teach these powerful training methods in a very easy to understand way so that literally anyone can master them. Even children as young as 10 years old can master these training techniques! You will also learn how to fix any behavior problem! That's right... I will teach you how to fix virtually any behavior problem. You're not only going to learn to house train your dog at lightning speed but you'll also learn to solve other problems like Barking, Chewing, Nipping, Jumping up on people, and alot more. You'll Even Learn How To Get Your Puppy to Ring a Bell When it Needs to Go Outside! You're probably imagining what it will be like to have a truly happy and well behaved dog right now but there's still more. On top of everything else, I'm going to teach you a new training system that's so absurdly effective, it has been used to train things in weeks, that would have taken old training methods years. One "side effect" to using these training methods is that they always lead to a better relationship with your dog. The reason for this is because you will be able to truly communicate with your dog. How to train your dog to do almost anything and how to do it faster than you've ever imagined. Seven Methods that you can use to quickly and easily fix any behavior problem! The fastest, cheapest, and most effective way to house train your puppy. How you can get your dog or puppy to Ring a Bell to let you know it needs to go outside! Specific Examples of how you can fix problems like: Barking, Running Away, Not coming when called, Chewing, Begging, and Barking when the phone rings. I'm not sure which one of those excites you the most but I do know that you and your puppies lives are about to change for the better. If you order right now you won't have to pay the normal price of $40 or $50 dollars, you won't even have to pay $30 dollars. You can get this book right now for only $9.99. What makes this even better is that you're not going to have to wait weeks for shipping or anything close to that. Instead you will be able to start learning all of these powerful training methods in only a few minutes. You should also know that I stand behind my books and back them up with a 8 Week 100% Money Back Guarantee. That means you can give my book a try without risking one penny! If you aren't absolutely amazed with the results you get after reading this book, I want you to let me know so I can give you a Full Refund. There's nothing for you to lose. Give it a try today and I'll look forward to hearing your Success Story! As you imagine what it will be like to really enjoy the results this book will bring you, I want you to think about how much better you and your puppies lives will be when you no longer need to yell and spank to get results. Instead you'll be able to teach your puppy virtually anything in a way that lets you both enjoy it. If you really value your relationship with your puppy, you need to give my book a risk-free trail run and see for your self why everyone else is raving about it. P.P.S. Don't forget, I guarantee that you will get results. If you don't have a better behaved, house trained puppy after using the information contained in this book, I will give you a quick, no hassle, refund.